News from LMCU: Great LMCU Member Perk! Discount Admissions To Cedar Point And Michigan’s Adventure! Great LMCU Member Perk! Discount Admissions To Cedar Point And Michigan’s Adventure! 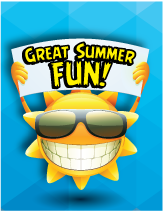 If you’ve got a summer outing to Cedar Point or Michigan’s Adventure planned this summer, you can save big on admission tickets through LMCU! Advance tickets are available at all Michigan LMCU branch locations.